← Walking With Dinosaurs 3D… the end credits! I am currently working in a another, brand new book about African prehistoric life with my friend Anusuya Chinsamy. She is the foremost expert in fossilised integument as well as African prehistory. We have worked in several books together and she has always been keen in open my horizons to animals other than our beloved dinosaurs. I love doing this kind of close-up portraits… it allows me to concentrate in the “personality” of the creature instead of seeking challenging action shots. 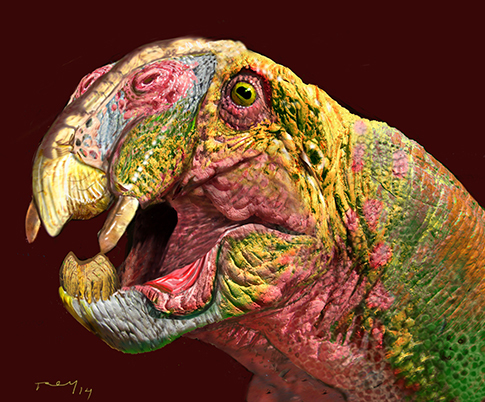 I have done this restoration for a dicynodont using some excellent fossil pictures she has provided me with. I have been careful to follow the skull as much as I could… this is the result and it pales dinosaurs in outlandishness! The book will feature many more illustrations and most of them are going to be either quite new or new versions of familiar material. I expect to follow this thread very soon. This entry was posted in African Prehistory, Proto-mammals, Reptiles and tagged Anusuya Chinsamy, Dicynodont. Bookmark the permalink. Hey, I checked recently the fantastic book Dinosaur Art and it was nice to see you between the several artist. An amazing book. I really liked it, and your interview was one of the mst enjoyables(with the ones of Henderson, Sibbick and Martin).